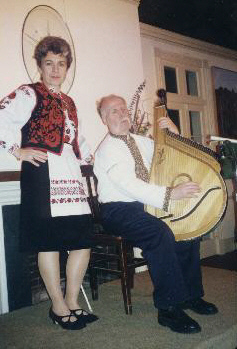 Pavlo Suprun performing in Charlottesville, Virginia in 1996. Next to him is the author. Although Suprun is totally blind (he cannot distinguish the difference between night and day) and although he speaks little English, he has successfully traveled to perform in Europe and the United States. He has been in the United States two times, most recently in 1998. 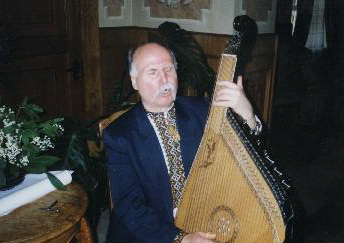 Kobzar Pavlo Stepanovych Suprun performing in Kyiv in 1995. Although Suprun was friends with Movchan and other kobzari who learned in the traditional way and although, like them, he is blind, he never served an apprenticeship. Suprun, like his wife Nadiia Mykolaivna are both casualties of World War II. Both were injured as children when they picked up land mines left over after the war. Both were sent to a special school for the blind where Pavlo's musical talent was recognized and he taken for special instruction at the conservatory. An unknown lirnyk and his guide with village children in the background. The photograph was taken in 1910 near Poltava. As pointed out in the article, lirnyky were more numerous in the Ukrainian countryside than kobzari. They have received less scholarly attention than kobzari, but they were very important to their village audience. Kobzari (from left to right) Stepan Pasiuha, Ivan Kuchuhura-Kucherenko, Pavlo Hashchenko, and Petro Drevchenko. Please note the variety of playing techniques. 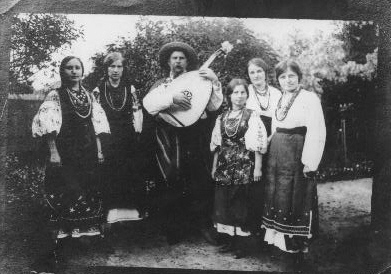 The Kyiv ethnographic ensemble, 1939. Front row, left to right: Petro Hudz, Ivanenko, Ehor Movchan. 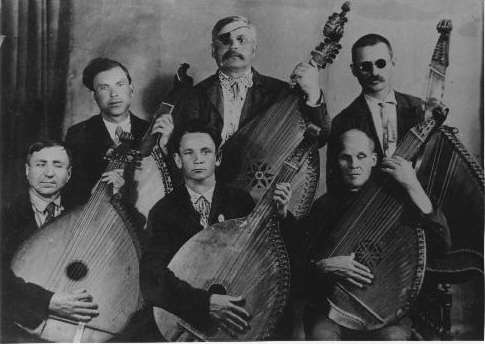 Back row, left to right: Volodymyr Perepeliuk, Pavlo Nosach, Oleksandr Markevych. As scholars interfered in the tradition more and more, minstrels were brought into cities. Instead of singing solo, the traditional performance method, they were organized into groups and ensembles. 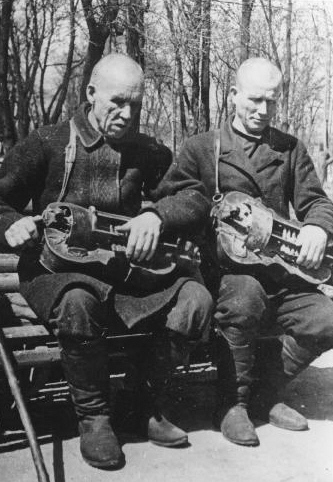 Two unknown lirnyky brought to Kyiv in 1939 to perform in a folklore ensemble. Although lirnyky were not as popular with the urban and scholarly communities as kobzari, they too were brought in to cities, asked to perform in groups, and otherwise encouraged to adapt to an urban audience. 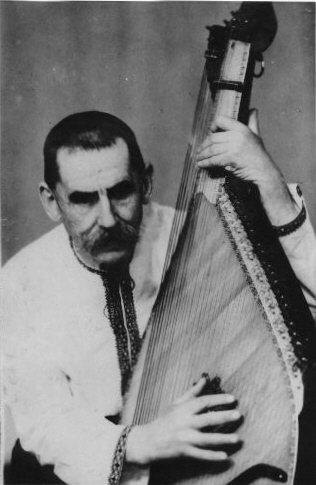 Kobzar Evhen Adamtsevych, 1950. Like Movchan, Adamtsevych was blind and trained in the old manner, that is, he was apprenticed as a child to a kobzar master, learned from him and then went through an initiation. Like Movchan, Adamtsevych survived Stalin's purges of minstrels and performed Soviet songs along with traditional material. Kobzar Ivan Kuchuhura-Kucherenko with a group of young women. Photo taken 1929. With time more attention was paid to kobzari by intellectuals and by urban dwellers than by the village folk among whom the tradition had thrived for centuries. By the time of Kuchuhura-Kucherenko, kobzari were a tourist attraction of sorts.